Richard L. Denney was born in Yokohama, Japan, the son of a career military officer. He is "Dad" to Jessica, Michael and Joey, "Grandad" to Amelia and Andrew, and partner in life, love and law to his wife, Lydia JoAnn Barrett. He is senior partner in DENNEY & BARRETT, P.C. Mr. Denney was admitted to the bar in Oklahoma in 1977. His legal education was received at the University of Oklahoma. Mr. Denney practices in multiple jurisdictions, at both the State and Federal level having received pro hac vice admissions in numerous states. He has also been admitted to practice before the U.S. Court of Appeals for the Tenth Circuit, Fifth Circuit, and Eighth Circuit, the U.S. District Courts for the Eastern, Northern and Western Districts of Oklahoma, and The Supreme Court for the United States of America. Mr. Denney is currently a member of the Oklahoma Bar Association; American Bar Association; Cleveland County Bar Association; the American Association for Justice; and the Oklahoma Association for Justice. Mr. Denney has tried and won Criminal cases, Commercial/Banking Fraud cases, and Civil Rights cases, as well as many multi-million dollar Personal Injury and Products Liability cases all over the United States. For over two decades, Mr. Denney's energies have been concentrated on pursuing defective product cases including automobile, tire, and other component part manufacturers in both State and Federal Courts. He has concentrated his efforts toward exposing the automobile industry's knowledge of defects in various vehicles including those involving inertial release and spool-out of the seat belt buckles and seat backs, rollover propensity of vehicles such as the Ford Explorer and 15 passenger vans, and the Ford/Firestone recall. He continues to rigorously pursue and document the automobile industry's knowledge of deadly defects. In July of 2001, he was named a recipient of the Steven J. Sharp Award, by the Association of Trial Lawyers of America for his work in tire and rollover litigation and his "contribution toward a safer, more just America," as a result of the Ford Explorer and Firestone MDL, where he served as Co-Chair for the Trial Committee. Lydia JoAnn Barrett was born in Dallas, Texas, in 1958. She is the daughter of a United Methodist Minister and an Early Childhood Educator. She earned a Juris Doctorate in 1985 from the University of Oklahoma. Ms. Barrett has received numerous honors and awards throughout her career. Lydia JoAnn Barrett is married to Richard L. Denney, her partner in life, love and law. She is a principal in Denney & Barrett, P.C. She has had the privilege of trying numerous lawsuits to million dollar verdicts. She practices in multiple jurisdictions, at both the State and Federal level, having been admitted to practice before the U.S. Court of Appeals for the Tenth Circuit and Fifth Circuit and the U.S. District Court for the Eastern, Northern and Western Districts of Oklahoma and The Supreme Court for the United States of America, and having received pro hac vice admissions in numerous states. Ms. Barrett is currently a member of the Oklahoma Bar Association; American Bar Association; Cleveland County Bar Association; the American Association for Justice; and the Oklahoma Association for Justice. She has concentrated her legal efforts toward exposing the automobile industry's knowledge of defects in various vehicles including those involving inertial release and spool-out of the seat belt buckles and seat backs, rollover propensity of vehicles such as the Ford Explorer and 15 passenger vans, and the Ford/Firestone recall. She continues to rigorously pursue both documentation and the automobile industry's knowledge of deadly defects. In addition to her legal pursuits, Ms. Barrett enjoys singing in her church Chancel Choir at McFarlin Memorial United Methodist Church and her membership in her social fraternity, Alpha Phi. She has three children: Jessica Joann Robinson, Michael Barrett Denney, and Joseph Leon Denney, and two grandchildren: Amelia Joann Robinson and Andrew Joseph Robinson. Jason Eric Robinson was born in Fayetteville, North Carolina in 1982. The son of a career NCO in the Army, he moved around quite a bit in early life and his family settling down in Oklahoma. He earned his Bachelor's degree in Biology with a minor in Chemistry from Oklahoma City University in 2004, where he met the love of his life, Jessica Robinson. He then attended the University of Oklahoma Law School where he received his Juris Doctorate. Jason joined Denney & Barrett in 2008 after law school, and has held the title of Associate Attorney since. Jason practices in multiple jurisdictions, at both state and federal levels. He has received pro hac vice admissions in numerous state and federal courts. He has also been admitted to practice before the U.S. District Courts for the Eastern and Western Districts of Oklahoma. Jason is currently a member of the Oklahoma Bar Association; Cleveland County Bar Association; the American Association for Justice; and Oklahoma Association for Justice. While at Denney & Barrett, Jason has tried many multi-million dollar personal injury and products liability cases across the United States. He has focused his efforts on exposing industry knowledge of defects present in automobiles, ATVs, and UTVs. 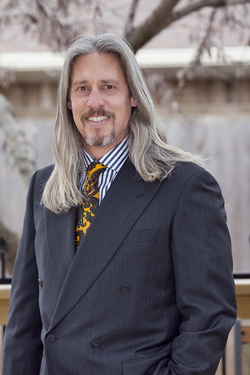 In addition, he has worked tirelessly to settle multiple Trucking Accident and Dog Bite cases. He may be an attorney to the rest of the world, but to Amelia and Andrew he is simply "Daddy." In addition to working for Richard L. Denney and Lydia JoAnn Barrett, Jason has the profound pleasure to call them his in-laws. A National Moot Court competitor in 1991, Russell practiced insurance defense and subrogation law from 1993-2005. Since then, Russell has specialized exclusively in trial and appellate brief writing. You may find more details at Russell's website - www.myworddoctor.com. In addition, Russell is a published author. His book, "Legal Writing for Real Lawyers: A Practical Guide from the Trenches," is a fun and informative practical aid for any lawyer wanting to improve upon their writing skills. You may find Russell's book here.